An unprecedented occurrence has taken place as the automotive industry prepares for the upcoming DrivingSales Executive Summit, October 22nd - 24th, at the Bellagio in Las Vegas. Two vendors, two of the industry’s most recognized names in proving sales attribution, have combined forces with marketing leaders from the nation’s top dealer groups to deliver the most unbiased, action-packed panel discussion in auto conference history. Before we reveal why this atypical panel lineup is worth attending, we first want to inform you of what this session is NOT going to be. This is NOT a reiteration of the importance of attribution when it comes to eliminating marketing waste. This is NOT a theoretical account of big data’s potential impact on improving your daily sales operations. This is a collaborative, all boots on the ground ATTACK on the two topics that have been plaguing dealerships for far too long: big data and attribution. AutoHook Co-Founder & President, David Metter, and Clarivoy CEO & Founder, Steve White, will be co-moderating a dealer panel that will leave attendees with a multi-dimensional, crystal clear picture of how successful dealers are already using big data and advanced attribution models to do the only thing that matters to them: sell more cars. Attendees will get a first-hand account from Marketing Directors at the nation’s leading dealer groups about how they are taking action and selling cars using data they already have available combined with technology that they’ve already implemented. Both AutoHook and Clarivoy have differentiated themselves in the industry for their unrivaled ability to define the path that resulted in a vehicle sale. However, these two companies go about solving attribution problems from two different angles and perspectives. But, what they both always agree on is that the dealer’s perspective is the one that matters most. Dealers are not, nor should they ever be expected to be data analysts or mathematicians. It should never be a dealership’s responsibility to scrutinize the 20 different vendor reports they receive in a typical month and find trends that point to success or failure in their marketing and sales operations. It should never be the dealer’s job to assign fractionalized credit to the multiple touchpoints that led to a sale. Too often, dealerships are debilitated by the excessive amount of one-sided vendor reports that flood their inbox every month. What good is all this data if it doesn’t include an instruction manual that pinpoints exactly what’s working and what’s not? If you use outdated attribution models, you’re essentially making marketing decisions based on 10% of what is actually happening. That is a HUGE marketing blind spot that can lead to tens of thousands of dollars wasted on sources that don’t convert. Wouldn’t it be refreshing if you could get a clear view of your sales and defection trends all in one place? Or quickly identify deficiencies in both your internal and external processes so that you can more efficiently assign responsibilities to your staff and get more ROI out of your third-party lead or traffic drivers? What dealers have been lacking is a complete, 360° view of their sales operations, as well as the sales they lost to their biggest competitors. How can you improve the way you sell cars if you’re unaware of the leads in your CRM that have already purchased somewhere else? There is a reason for every lost sale, and that reason is exactly what you should use to take action and reclaim lost opportunities. Attend this session and you will take away a lot more than the inspiration and motivation you need to take action. You will walk away with a game plan that you know has already proven to help individual dealers and dealer groups sell more cars and increase their market share. The topics of big data and attribution will transform from headaches, confusion, and irrelevant, obscure numbers into actionable steps to improve the way you operate today. Learn the fastest methods of uncovering actionable sales and defection trends hidden within your data. Define the sources responsible for your greatest opportunities and losses down to an individual salesperson, lead or traffic source, competing brand or dealer, and more. Eliminate “Marketing Blind Spots” and grow your market share using the automotive industry’s latest and most accurate attribution models. Do yourself a favor. DO NOT leave Las Vegas deprived of this vital and enlightening knowledge. DO NOT return to your dealership in the dark. Join AutoHook, Clarivoy, and their panel of top dealers, to finally get a clear and complete view of your market and how to outshine the competition. THE ACTION STARTS TUESDAY, OCTOBER 24TH AT 9:50 AM SHARP AT THE BELLAGIO IN MONET ROOMS 3 & 4! 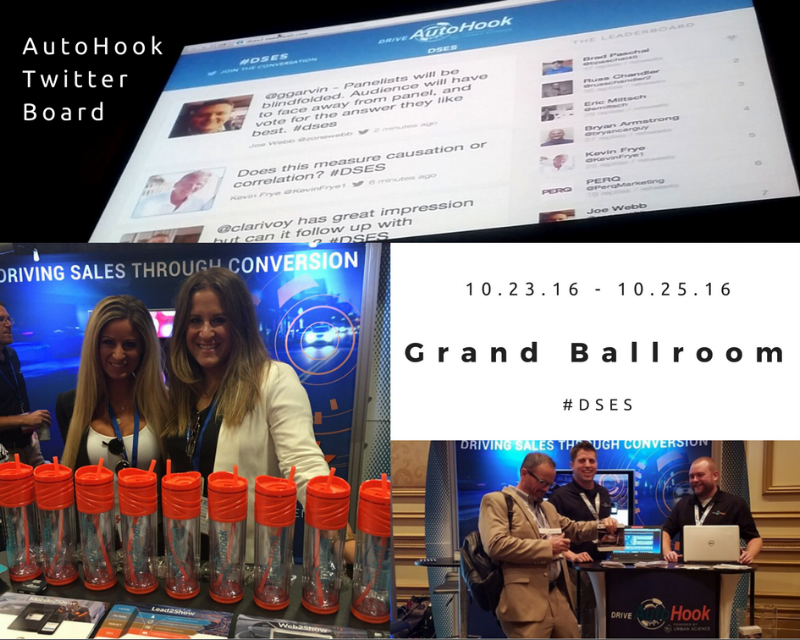 Last week, the AutoHook team had the privilege of attending these two back-to-back events at the Bellagio Hotel in Las Vegas. Our Vegas adventure began with the DrivingSales Executive Summit, or the “perfect storm of awesomeness,” according to DrivingSales Founder & CEO, Jared Hamilton, and ended with the J.D. Power Automotive Marketing Roundtable – a sophisticated gathering of the smartest minds in data, analytics, and automotive marketing. Thank you to all who stopped by our booth. It was awesome sponsoring the GIANT twitter board in the main ballroom. We were honored to keep the tradition alive! Pictured: Lindsay Kwaselow, Ani Hagopian, Danny Benites, Andrew Pargoff, Brad Somervell - and can't forget KEVIN FRYE on the twitter board! A little team-bonding with an incredible view and incredible food AND service. Congratulations to Steve White of Clarivoy for being the 2016 Innovation Cup Award Winner! Clarivoy came out on top and impressed the judges with their proprietary TV Analytics solution. Their new solution is designed to match advertising spot data with website visitors, providing a transparent snapshot of which TV ads influence sales. The four other Innovation Cup finalists also deserve a special shout out and recognition for their participation in the event. More importantly, we commend these industry leaders for their efforts to change the automotive landscape for the better, through new and groundbreaking technology. Congrats to finalists, Tarry Shebesta, President of DriveItNow & Partner at GoMoto, Tom Gallaher, Co-Founder of AutosOnVideo, Bryan Harwood, CTO of Outsell, and Eric Miltsch, President of DealerTeamwork. The chaos got real during the transition from the DrivingSales Executive Summit to the J.D. Power Automotive Marketing Roundtable. Thankfully, AutoHook leveraged some unbreakable teamwork (and a much needed rolling cart) in order to move from the Bellagio Ballroom to the poolside cabanas (in record time of course). We all got a nice workout during what felt like a six-mile hike down to the pool. Except for our Client Services Manager, Ani…she got a VIP ride with all our swag boxes, courtesy of our Business Development Team Lead, Travis. Complete with live musical entertainment, delicious hors d’oeuvre stations, a fully stocked bar, a silent auction (…signed Taylor Swift poster anyone?) and only the best of the best were in attendance at the poolside kickoff party. This was definitely the most jam-packed day of the week. So many sessions to see, data insights to absorb, and important connections to be made! AutoHook’s Big Data Panel - We’ve Got the Data! Now What? If anyone suffered the unfortunate tragedy of not being able to attend the J.D. power panel that had attendees fighting for seats and lined up against the walls, don't worry. Watch out for the official panel recap coming next week. The rooftop of Drai’s nightclub served as the perfect atmosphere to connect with industry peers while overlooking the Las Vegas Strip. Thank you to Deep Root Analytics for sponsoring this great networking event. The AutoHook team sponsored our very own cabana at Surrender Nightclub Wednesday night at the Wynn. During the party, we met a lot of incredible people, got in some good team-bonding, and networked like we’ve never networked before! The team attended several content-packed sessions and ended the trip feeling inspired, armed, and ready for 2017.